There will be one more item added to each box - something I designed but didn't have a chance to finish to post this morning. I will post photos as soon as I can cut the file. I noticed that my blog hit counter is nearly to one and a half million - when I looked before writing this post there were only 1863 hits to go. This will probably happen tonight or sometime tomorrow if the traffic is typical. When I see that the counter has passed 1,500,000 I will do the drawing and post the results as soon as possible. I will try to answer the questions that have shown up in the comments in another post. I do read each and every comment and really enjoy hearing from so many people. I hope you'll keep commenting more regularly, here or on Facebook, now that you are in the habit (wink!). You can comment on this post for one last place to get a chance for a box. Here is the "question" for today. I'd love some direct feedback on my blog. A lot of you have made me blush by saying sweet things in your comments and that has been a lovely boost to my ego(!) If you have been with me for a long time, you know that there have been changes over the years - the blog has evolved along with me as my interests have developed and moved in new directions. So please let me know what you'd like to see more of, what new areas you'd like to see me cover and also tell me if there are things you don't like. Do you want more videos, product reviews and tutorials, Cricut, Silhouette or other die cutting machine information, photography tips, digital scrapping help, travel photos...or just whatever I feel like posting (the way it is now!). I do have some plans in mind, but before I outline them I'd like to hear from the people I write for. "What i always love to see is sizes on the crafts. I have a cricut. but we use cm and not inch. So For me it's helpfull when the size is added with the project. I love mini albums, as you already make. Just tutorials is what i like on blogs and why i come back all the time. Would been a honor to win the giveaway. Because you have such beautifull stuff in there we don't have here. I would love to see more CCR tutorials like the one's you did for DS. Thanks! I enjoy your variety. I like your step by step tutorials when you do those, especially when you have the sizes included. You just awe me with your projects, so I just drool over your stuff! I have been following your blog for quite a while now and I think it's perfect just the way it is. I love your creative ideas! Thanks! Your blog is the one I check EVERY day. I, too, am a CMC (for a while longer at least), so I enjoy the use of some of our product. I love how you are "soft sell" on anything. You put it out there, but you don't make your blog about hawking something. So many good blogs have been ruined for me by the hard sell tactics. I love your ideas and the fact that you post EVERY SINGLE DAY! Don't change it too much-I like it like it is! I'll sign this one-forgot I was using anonymous! I am a blog subscriber. Oh and I love how the boxes look - so pretty and pink! One reason I love to read your blog, is the variety. I have interests in all kinds of papercrafts so appreciate very much all of your ideas. I was first attracted to your blog from the videos. I love how tos and you are a great teacher! I would love to see some tutorials on importing svg files! I recently purchased a candy box and when I imported it into MTC the size was really small. It also had a coordinating liner! So I had no idea how to size either of them being the non-math genius that I am. :). I have followed you for atleast 2 years, maybe 3! You keep my interest...the variety, the information, your Cricut ideas, your use of various products, you introduce me to new lines, your thoughts & ideas & travels & pictures....favorite..mmmmm...V A R I E T Y and never knowing what I will open up EVERY morning!!! 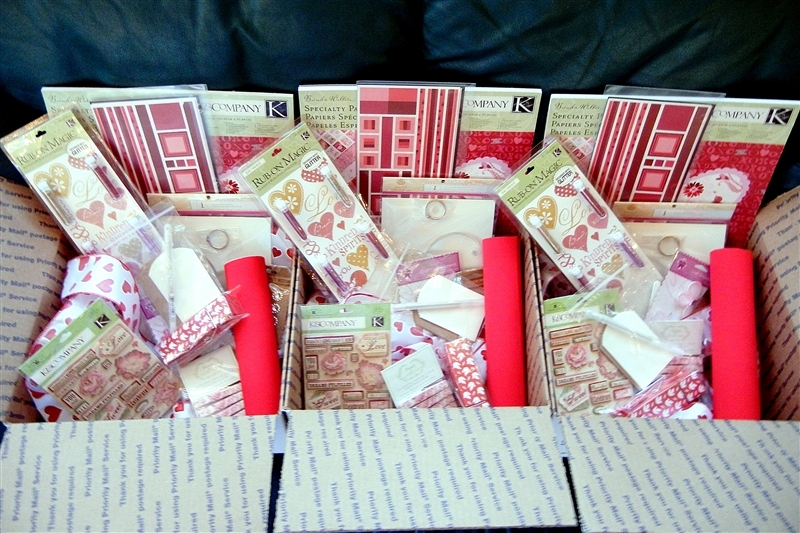 Thanks again for the chance to win one of these FABULOUS boxes. Whoever wins will truly enjoy it! Cheers to You & Capadia Designs!!! I love seeing what you are doing each day - I really enjoy your travel photo's and seeing all the interesting places you visit. You always are very informative and a nice read while drinking my coke. I like the variety on your blog. More of the same is great with me. Thanks for the fabulous give away! As Mr.Rogers would say-I love you just the way you are-so what you are doing on the site it perfect-something for everyone.Tweak it as you see fit. Enjoyed the box additions each day. Best of luck to the winners-and happpy crafting to all. I so enjoy receiving your newletter each and every morning in my email inbox. I would like to see more step by step tutorials and also I am really new in using the Cuttlebug and the Spellbinders so would like to see projects / tutorials on using these items. I love videos where I can see how you do a technique. I have not been crafting too terribly long so I love to see new techniques. Your blog is one of the ones I like as you show a variety of things. I always enjoy your blog! I think that the variety is wonderful! Whatever you post is okay with me. It's kind of like talking to a friend over morning coffee - you never know where the conversation will take you. I love your blog. I like how you show us everything beautiful from your travels. But the main reason I come to your blog is for tips and tutorials on the use of the cricut - either for scrapping or creating other crafts. But since I do not craft every day, seeing just "whatever" on your blog fits just great! Happy Blogoverysary! I am also a blog subscriber/follower! hi D, your blog is your blog, so you should really do what you want to do with it and I love it the way it is. I joined you a long time ago, when I first got my Cricut, and you helped me so much with technicalities about the machine. I've loved seeing you evolve over the years. One thing, however, that I would love to see, is some finished scrapped layouts. I think I need the encouragement to get my pages done, not just to work on the techniques. Thanks for being so great! I personally would love to see more photography tips and if you have any tips on making my blogging catching up faster and mre productive that would be Fantastic! I enjoy reading your posts as well as your followers' THANK YOU for all you do! Thanks for a fun blogoversary!!! I am a follower and subscriber, TFS and for the chance to celebrate with you, Happy bloggoversary and may you reach the 1.5 mill milestone soon! You've been most generous with the time spent and information provided on your blog. Your tutorials are better than most and I love to see photos of your travels and experiences peppered with projects. I truly would not change anything...the variety is great! I have been a subscriber/follower for many years! I would LOVE tutorials on digital scrapbooking and designing with the cameo. Thank You for all the help you give us! Well first, this has been fun. I think you should do whatever you feel like you should do on your blog. This is YOUR way to show your creativity. Thanks for the chance to win. Happy Blogoversary. Hi Diane, I like a lot of things on your blog, I enjoy the recipe. I really enjoy the tutorials and my all time favorite is how you showed us to ''hide selected contour'' on the Cricut Design Studio. You cannot believe how much cardstock you saved me!! A big thank you for this opportunity and also the fun of participating. Have a great day. I enjoy seeing what the silhouette can do but I'm a diehard cricut user. I have too much invested to even think about getting something else.I would like more cricut projects. I also enjoy your photography info and your travel photos. I get to travel vicariously through you. lol Thanks for everything. I have to agree with some of the other comments! Your blog is wonderfully entertaining~ always something new and creative...not the same types of projects. It is so nice to see the variety between your amazing photo skills and creative mind. I wouldn't change a thing! I am also a subcriber and love that you have stuffed those boxes so generously. Thanks for the chance to win. I am a very happy follower and subscriber! Thanks for all you have shared! FB fan as well! Have a GREAT friday and a very great weekend! See Your stuff is to the point and no messin'around. If You could do some on what svg? acb's of pdq's. AND also maybe on esp on WELL this might sound dum and stupid.Well how does one take a digi? stamp which if i understandin it you pay a comp for the print design right? I love the variety on your blog. I enjoy craft in ways similar to you so I've found most of what you do helpful and interesting. I also love to see a little bit about you. I feel like I know you as opposed to reading something a bit more dry. My Silhouette is on its way to me so I'm looking forward to more activities using it. The other thing I personally am working on is better photos. I only use a "purse" camera and I'm still trying to learn how to use it better. Please know that my comments in no way reflect a displeasure with where your blog is right now. I think it is fantastic and enjoy reading it on a daily basis. I enjoy reading your post every day and find great ideas that get me started thinking. Thanks for sharing your expertise with all of us...but can you move back to PA and form a group with me? LOL! I very much enjoy your blog. You have shared some awesome Gypsy files, that I have. Do you have any plans to do some video on make the cut? I have the program, never updated after the law suit. Keep up the good work. I enjoy your photog with your family and travels. I think your blog is wonderful like it is. It makes you happy and your readers happy! Thanks so much for doing your box giveaways, it is always fun to see what is added each day! I like all the different things you post. I would like to see more cricut stuff. I really like the photographs you post. Photo tips and whatever you feel like posting. i love the photo's you have shown us, they are so beautiful. I love your blog! I love that you mix in so many wonderful photos along with crafty things you make. I'd really like to see more tutorials, photography tips/tutorials (both how to take a photo and how to edit it to make bad ones good), and digital scrapping especially with software you can get for free (if there even are any). One thing I'm particularly interested in knowing is how to design and create digital scrapbook paper for use in digital pages or to be printed out. I have been a subscriber to your blog for many years now. I love the information you provide about products you enjoy working with. I do miss the cricut files you used to post, especially since my hard drive crashed and my cricut project files somehow were not saved in the backup I had previoulsy done. I recently bought a silhouette (not the Cameo, just the SD) and I would love any tips and tricks you have for it. Unfortunately, I am a little more computer challenged than you are! Thanks for the inspiration your blog provides. I love how you capture the simple beauty of objects in your pictures through your artistic eyes. Diane, you have such a great variety on your blog, I try to never miss a day. If I do, I will go back and pick up the one I missed. I have been following you for a couple of years now and as I have said before, you are truly an inspiration to us! I would love to see a little tutorial on the Silhouette, although I don't own one. I love to learn new things! Thanks for all that you share, and your boxes look amazing! Diane, I am a follower. Thank-you! Great number it is! I have been your follower just a few days and seen some of your projects along and you are very creative and love how you show how you made your projects. I love to read anything you will post, no pressure. Relax and Enjoy crafting! I think you do a wonderful job with your blog. You give us a large ray of ideas and uses for all of the items. I also, love videos. Thanks so much for all of your hard work. I love the variety of the projects you post daily. I open the e-mail from you first in the mornings to see what you have to share. I mostly make cards, so love what you make and all the ideas. Thank you for all the work that you put into making such a beautiful and helpful blog for everyone to view. I would love videos via ustream tv with live chat. You have out done yourself. Would absolutely love to receive this box in the mail. Keep up the good work. I have to agree with those who think that you shouldn't change things too much. I, personally, like tutorials and videos but I also enjoy the other things you post that I didn't know I wanted to see. That's what it's all about, showing things that are new and different and not necessarily something that we knew we might be interested in. Congratulations on reaching 1,500,000 and keep up the good work....please! Diane, I've been following your blog for more than a year now. I have enjoyed many things, most recently especially your photos from Spain and how they have shown up in your crafting. Finding inspiration is often a consideration for crafters, and you have provided lots for me. I am learning to use my Silhouette, so more on that is always welcome. Congratulations on a million and a half! Hi Diane. You are so sweet to ask what we like and don't like. I love everything you post. When I got the Design Studio, I would have taken it back if it hadn't been for you. You posted a lot about the Design Studio and even answered emails from me when I had a problem, even when you were out of town. Now I'm using the Cricut Craft Room and would love to see tutorials on that if you use it. I would love to know how to... you know in the DS you could hold down the ALT key so you could move the box around but see where you were going with the box (I learned that from you). I would like to know if you can do soemthing like that in the CCR? I love how you make us all feel like we are part of your family. You get to travel a lot and for those of us who don't, we get to see outside of our box through your eyes. Thank you for all you do for all of us. You're the best. Diana - your blog was one of the original blogs that i started following. When I met you in Chicago @ CHA I felt like I already knew you. Your blog is a wonderful reflection of you. I love your personalization. The projects you share are amazing. I love how you show us photo's of things that inspire you or of your trips! I recently made a simple tone on tone card after seeing all the "white" ornaments in one of your photos. Basically I am saying I will love whatever you decide to do!! Thank you for offering this chance to win such a special package!! Happy Blogoversary!!! I love the variety of projects on your blog and all of the tutorials. It is the perfect way to start my morning. Your blog is one of those I search when looking for a unique idea and because I believe your blog should be an expression of your gift and creativity, I think you should post whatever holds your interest. I love your videos, your tutorials, guest designing on other blogs and making me think about using the not normally a "craft" item in a project, but I just enjoy seeing what you have new each day. I enjoy your blog,it is always a learning experience, and how you o share about the places you go to.I love tutorials and learning about new product s.Keep doing what your doing. Your blog is quite unique. I love your designs along with the tutorials and tips, but I am also a fan of the photography highlights of your adventures. Being an amateur photographer myself, it is always wonderful seeing your shots. I do enjoy tips on the Cricut, DS, and hopefully, CCR. I am not a big fan of CCR and need more info on how to navigate that program. Love all the dimensions of your blog! I love the variety of things you offer on your blog. I don't think I would change a thing. I love how you cover the photography side of things along with the actual crafting things. So thank you for such a wonderful blog! I love all your work. I like all the details you list when you make a cut file. I have been a follower for a while now and I really like your blog. I really love tutorials. I would like to see you do more on cricut and silhouette! I would also like to see photography tips. The 1 thing, I would like to see you change is not to post so many pictures at one time. It takes forever for them to download. Maybe you could post 1 or 2 and write that you have more on your blog! - - Just a suggestion! Well, Diane ... I've been following you since, well, since I first started following blogs and learned about blogging which is about the same time I started paper crafting, which isn't that long ago itself, maybe 2 years ago. Because of you, I started my own blog and learned more about papercrafting and cardmaking. You haven't taught me all I know (and God knows you shouldn't have to know what's in this juicy brain of mine, not all about paper, for sure! ), but you've taught me to open my mind to new ideas and creativity. You've been a joy, a friend, a talent, an inspiration. THANK YOU. And happy 4th Blogaversary!! I'm coming up on my 2nd BlogoV and now have almost 1100 followers myself, WHEW! Look what you started! ...and of COURSE I follow you! Everywhere!!! Diane, I have been following your blog for over a year now- that's how long I have been scoping blogs. I find myself searching your archives for projects using the Cricut cartridges that I have. Many are now retired- and I need a nudge to explore the cartridge more when I am craft challenged. I do love all your posts but I am not yet in the craft room, I need to make at least 100 more cards before I can justify another Cricut purchase-ha ha. Keep sharing! i have been following you for several years, almost from the beginning i think. i would love to see more video tutorials, especially on using the silhouette. you amaze me with your ability to create such intricate and interesting shapes. i really appreciate when you give the dimensions for cards and the elements on them. thanks for all you do for the crafting community. I actually love your blog the way it is you cover just about everything! It's a nice balance too.....I know whatever you come up with will only enhance your blog! As always Happy Crafting! I am a long time follower who checks your blog every morning! I learn so much from you and really appreciate how you share your ideas and talent with us. Since I'm a new Silhouette Cameo owner I would love any info on using this fantastic machine. I also still have my Cricut 'cause I've got a lot invested in it - but I do love the Cameo. Diane, I really enjoy your blog the way it is. I love that you share your photography and your home life with us. I'm looking forward to reading whatever you feel like blogging, because I know it will fun, creative and informative. Thanks for sharing with us. I'm a huge fan of your tutorials. I'm not very creative, so your step by step and pics are great! i love all the Cricut projects you do! Keep up the good work! Happy Blog Anniversary too and thanks for a great give away! I always love things w/ cricut, mini albums, cards, scrapbook layouts...any and all. Thanks for the chance to win and Congrats! I love your blog. I really enjoy the one day a week where it is about your travels. I don't get to travel much so it lets me live vicariously through you. I love tutorials of any kind and think they would be a great addition to the site. Also it would be nice to maybe see a video or two of your craft shopping hauls. It is one of my favorite things to watch on youtube and would love to see what you get. I love tutorials. I am visual learner. I have a Cricut and a Gypsy and learn a lot from your. I hope someday to get a Cameo. BUT I really like that you do so many different things. I don't think you should change a thing. I am a FB follower but I read you blog. I am not a good FB fan. I just don't know how it works. I am a follower and enjoy the easy of getting an email when you post. I am one who feels like your blog is your personal "baby" to use as your voice:-) You share a great variety of interesting things that I enjoy other than crafts like the travels and photography:-) The two things that I still need help with are coloring techniques for digi stamps and digital scrapbooking. If you have any helpful advice on those, I bet a lot of people could use it!! You are so dedicated to have a daily post ... that is something I have not even considered ... I am lucky to make once a week:-) Keep up the great work and thanks for the very fun "contest"!! Your variety has been a reason for being a follower and have been an important tool in my daily crafting. Your projects are such inspiration to sometimes think outside the bos. Just keep up the great work. Following up on some of the older cartridges that we toss aside for the new great cartridge would be helpful to many. Hi Diane! I think that you should do your blog just the way YOU want to do your blog! I enjoy the variety of items that you post. From pictures of your travels to your neighbor children! I learn best from having both the video tutorials and written directions--but that is just me! You have a great eye for color and wonderful talents. Thanks for sharing everything that you share! I am a longtime email subscriber. I consider you one of my most important "tools"! Thanks Diane! I have enjoyed the variety of your post over the years. I am a scrapbookpages.I have the Cricut, Craftroom and SCAL. So any help with those would be great. I know you bought the Shilouette and would like to learn more about this. I tried the software and it seems a little complicated. Any help there would be appreciated. Like trying something new. The Craftroom is a huge improvement over DS, for sure! Would love to win the box! Thanks for sharing all your talents with us! Thank you for your blog. I like how it has changed over the years. It has not become stagnant or boring. I prefer tutorials, both video and written. Tutorials that include a new product review are even better. I love to learn new things. I think that is what brought me here to begin with. In general, I enjoy the variety on your blog. Sometimes crafts, sometimes pictures of architecture that inspires your creativity, etc. Thanks for all the time you put into it! Thanks for sharing with us all that you do. I have been a follower for a while now. I like your blog...it has lots of good things...I have the cricut and scal2, so any help there would be great! Keep up the good work. I have been a follower for about 3 years now and you have taught me so much. I could not even get DS to do anything before reading and following the directions you gave in your posts. I do think Craft Room is still much easier than DS. As I said in a previous post my area is rather craft starved and so many of the techniques I have learned from you were not known in my area. I have amazed some friends I have that do some crafting with ideas I learned from you. I LOVE YOUR BLOG!! I feel like I've been following for a long time but don't know exactly how long. I love scrapbooking first and foremost. I use Cricut. You are so creative and I would love you to do cards or LO's highlighting some of the older cartridges. I love home decor projects too. I love what you do on Design Studio too. Enjoy ALL of your travel pictures. The only thing I don't like about blogs in general is when they feel like they are turning into a commercial or sales pitch. I have quit following some for that reason. Sharing your creativity and mentioning products you use are fine though. I enjoy your blog, I think the variety way is the way to go, so there is something for everyone, but using the cricut is what I like I get lots of ideas. I like that you include a little bit of everything on your blog. Scrapbooking, cards, photography, crafts. Your stuff is great! I wish I had your talent. I love seeing the variety of stuff you post on your blog. I've only followed for close to year now, I believe, but it's the one blog I check out every day...even if I don't leave comments. I love the way you archive the videos on the cricut projects. I would like to see more projects with other new tools. And of course more travel themed projects or LO's since I travel a lot. Keep up the good work. I love your blog! I wouldn't change a thing. I especially love your tutorials and videos. Thank for the chances to win. as so many have said, the variety on your blog is great, never know what will be on it every day! I miss your ideas for the cricut, but followed closely your new journey with the sillouette to see what you thought of it. can't wait to see where you go next creatively! i am a daily follower! thanks for sharing your personal journey with us as well as your 'crafty' journey. I'm still pretty new to all this. I got my Cricut at Christmas. I love reading your blog. It's very helpful in understanding what to do. You are very creative and i like that. Be assured, your blog will be looked at everyday from now on. After looking at some of your past blogs, I would say just keep posting the way you are now. So much variety. Love your blog. Don't change a thing. So enjoyed all the wedding favors and ideas you had for the wedding. And I have only written to you the once, but you replied within seconds. I love getting your email to go to your blog. You always have some interesting things, Love your photography! I love paper crafts but only have a cricut and the such.So more with this. Your imagination is fantastic and inspiration to all that follow you. Thanks. Your blog is fabulous! I get them by email and have save every one for a year since I joined. I never watch the videos... that's just me. I love seeing the finished projects. And love the intro to new products - you have introduced me to so many things that I didn't know were out there and new ways to use them. My scrapping group is now jonesing for a Sillouette! Your list of the box contents has inspired me to go shopping. I think I'll have to take a tour of the stores you mentioned this afternoon! Thanks for all your thoughts and ideas! And if I didn't love your blog I wouldn't be an avid follower. And love seeing your page come up on FB. I love the tuturials. I receive a lot of information that way. And I like when you show new tools of the trade. Any new tricks that you have learned is very interesting and I try and duplicate them when I can. Your blog is very interesting the way it is. Love the tutorials. I own a Cricut so of course I lean towards things geared to that. I also love svgs. Whatever direction your blog takes I will follow. p.s. thank you so much for the chance to win a box. That would be awesome!!! I hve been following your blog for quite a while, and enjoy what you do now. I like product reviews and simple tutorials. Its nice to just see your ideas and what you did inspires me to do something similiar. I enjoy the variety of your blog. This way you keep the interest of more crafters. Your tutorials & videos are wonderful. I want to thank you for all the help you have given us on using the Design Studio. Would never figured it out without your help. I have beem a follower of your blog forever and have enjoyed the variety. Some of my first DS files came from you and I still use them! Keep up the good work, I enjoy reading your blog every day! I am a follower / subscriber of your blog! I'm also a fan of your FB page too. I love your site just the way it is. Always interesting. I'm in love with my cricut expression so anything cricut is my favorite but I know others have different favorites so your site offers a little of everything. Thanks so much for all the help you put out there for everyone. Take care and have a good day. I have a Cricut so anything with Cricut projects is nice. I also like your tutorials so please keep that going. I was wondering if you could explain your codes on your sidebar under Cartridges Used/Topics. Thanks and keep up the great work! I also subscribe to and follow your blog. Everything you create is so beautiful and inspirational. Thank you for all the time you spend making us happy!! I am for more tutorial and videos. Your cards and ideas give so much insperation. You alsdo help a lot with cricut. I don't think the information that comes with the cricut and cartridges is all the informative on how to figure the size to cut things. You do a much bettr job. I would prefer that you left your blog postings as they are now. You do a wonderful job of keeping it "real" and interesting. Thanks for all you do for us and thank you for the opportunity to win such amazing items. I enjoy the variety you offer on your blog: crafting, cricut cuts, photos, travel sharing. I don't have any requests other than you keep your blog real about what you desire it to be. Thank you for the opportunity to win a wonderful box full of goodies. I am a long time follower of your blog. As a new crafter, I have always enjoyed your site. However, what I enjoy the most are the tutorials and the step by steps instructions that you include for specific projects. I am a simplistic person who is trying to step out of her comfort zone and do bigger and better projects. You site gives me such creative ideas to shape into my own projects. I am a lurker on your blog, I am one of those who visits everyday, but seldom responds. I will try to do better at sharing my thoughts on your postings. I have however sent you several emails to which you have responded and helped me a great deal. I am always going back through your archives looking for help files and wonderful ideas. So my suggestion for your blog it to keep doing what you are doing, sharing the love of crafting! I love all the stuff that you have on your blog!! Sometimes I see stuff that you make & gives me & idea that I would not have thought of. Thanks for the chance to win!! Your videos and tutorials are a immense help to me. I am just getting into CCR and would love to see more tips and tutorials for it. I have DS and seem to fall back on it since I know about it, but still could use more tips on using it. Your photos of your work and travels are very inspiring! Love your blog, especially your cards which are always so clever and cute. Especially like your use of the Cricut. Thanks. What I love about your blog is the way you show the progression of the projects you make. So I guess it is the tutorial part I like the most. I too have varied interest in my crafting endeveors. So what ever you like is ok with me too. Thanks for taking the time to blog with us and all your inspiration and encouragement. As I have said before, I look foward to your emails for new projects as it gives me alot of inspiration. I personally like written tutorials as I am a hands on person. If it is a video, I have to write in all down. I love all things to do with cricut as that is the machine that I have. My two passions are flowers and gift card holders. I like to see new and different ways to make cards and those two items. Thanks so much for a great blog hop and even if I do not win, it has been fun and interesting. Thanks. I have enjoyed your blog for several years now. Don't know that I would change a thing. I'm a Cricut owner so, I enjoy getting movitivation to use my older cartridges, and examples of the new ones. I prefer picture tutorials to videos(it's a hearing thing). Congratulations on Four great years and here's to many more!! tammyK. I believe that what makes your blog so much fun is that we never know what is coming next. Also, that it is about what interests you at the moment. I would think if you had to try to please all of us you would really get burned out. The great diversity is wonderful and for those of us who don't get to travel, so interesting. I found you accidently shortly after you began and haven't missed many days of having a "visit" with you. I have learned much from you and also dared to branch out and try new things because of seeing your creativity. Hope you are all well now and rested. Thanks for all you show us. Your blog is one of the first I started following, i just love it! I love tutorials and good tips and where I can purchase supplies for good prices. I would love to understand the whole digital scrapping thing so more on that would be good for me, otherwise I love what you post! Selfishly, since I only have a Cricut and use DS and CCR, I would like to see projects you've made with those products. BUT, I'm always entertained by whatever you post on your site, so I would be happy if you just continue on as you've been doing. Since you have some plans in mind, though, I'm sure I'll love whatever you choose to do! When you're having fun, I'm having fun! You're definitely a daily habit. I think it's your variety, writing style, lovely photos, and lack of pushiness of products that work for me. Thanks and congrats! 1. Love your blog Diane. Your step by step tutorials help a lot. My main interest is cards (that I give away). I love making flowers. I like to make them look real. Thank you for your inspiration. Also thank you for sharing your life with us via photos and stories of what is happening. Wish we were neighbors but for now it will have to be via internet. Diane, I have been a follower for probably less than 2 years, but I love that in that time in addition to some fun projects I've gotten to know a bit about you. I loved following the wedding projects, and the events that happen in your town (and the snow, which I only like in photos, so you take care of any cold winter viewing). One of the things I think I'd like you to include are some more details, like cut sizes. I have used some of your cut files (including the flamingo on hearts card), not everyone has the tools to do that. I also love that you share a variety of project types -- keep up the great work! I don't think I would change a thing! I love your beautiful photography, your organizational tips, info about different products and your creative ideas! I could go on and on! You are an inspiration! I'd like to see more cricut projects with sizes and cart instructions, maybe videos of it as well. Your blog was also one of my first forays into the world of Cricut. I always look forward to your projects... they're so innovative. I think I'd prefer to see more projects on your blog (though I know you've been crazy busy... for the last year, it seems). Also, the only product review request that I have is the Teresa Collins Stampmaker. You've been so busy since CHA last summer that I fear you've forgotten about it! :) I have such trouble with mine, and I think watching you do the process (with all of the helpful little tips and tricks that you always seems to come up with) would help me immensely. Congratulations on your 1.5 million hits! Your papercrafting "fame" is definitely well-deserved! Wish I have more time to spend here this week but have been swamped at work with a special sale going.... you know how it is putting in those long hours! Want to congratulate you and say how awesome your blog is and an inspiration to all! Thanks! I've enjoyed everything you've done. I am one that would like more instructions that can be printed out to go back on when I'm doing the project. I have a Cricut Expression and use MTC. I'm still in the learning process though, so anything helps me. The boxes are looking awesome. I'm truely hoping that I am a winner of one of those awesome boxes. Thank you so much for all you do! I am follower and a subscriber. So glad your blog is doing so well. I know that I enjoy it everyday! Thanks for the chance to win one of those awesome boxes of goodies! I have been a Facebook fan for awhile also. Thanks for another chance to win. Diane: I enjoy the assortment of crafts you give us. Love the Cricut ideas as I love to die cut cards and things for the scrapbook. Keep them coming - love your blogs each and every day. People really ask you to list what you are GIVING them? Wow! I get so much inspiration from your blog, mostly your amazing pictures! I love following your travels. I would love to see Silhouette projects. I am on the fence. I hardly use my Cricut any more. I am a PTI addict but I am interested in how well the Silhouette cuts words. Thanks Diane, I am grateful for the chance to win whatever is in the box! I enjoy your blog, you are a great photographer. More photo tips would be great.